Some areas of my life needed more attention and a shifting of priorities was in order. My new full time job, which I greatly enjoy and find very fulfilling, has changed my personal needs. I do not go to work and do my job thinking about the time when I get home and can then work on the stuff that matters to me. Instead, I go to work and it matters to me. This is fantastic, a very welcome change, but it also means that when I get home, I’m tired and I’ve given of my creative energy already and I often just want to chill, not work some more on other things. I was spreading myself too thin with too many commitments to too many people and places. 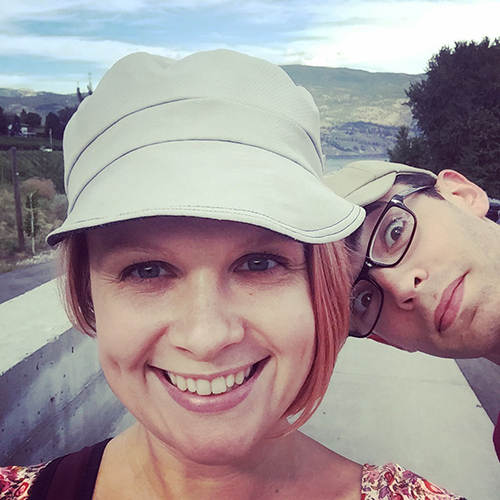 Combined with the above-mentioned need for a priority shift and my lessened need for an extra energy & creativity outlet, it was time to decrease some of those commitments. And my commitment to this blog was one of the things that got put to bed. UPDATE: Thanks to you wonderful donors’ generosity, we have hit my $1000 goal! There’s no reason we can’t keep pushing onward to raise even more funds for the BC Children’s Hospital, but first let’s pause a moment to enjoy this achievement and with it, the promised amazing art of Addie and her Lava Bear pal by Featherweight. 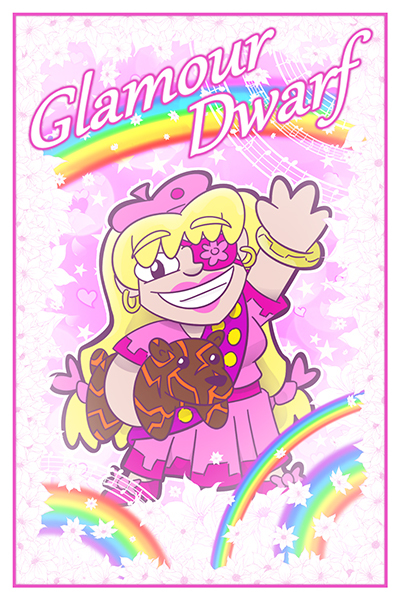 All my donors will receive a high quality digital copy of this after my campaign, and those who donate $50 or more will receive a physical postcard in the mail, featuring this art and signed by Addie and Larry Beartrand the Lava Bear! Many thanks to Featherweight for this incredible drawing! If you’d like to support and see more of his work, please consider contributing to his Patreon. 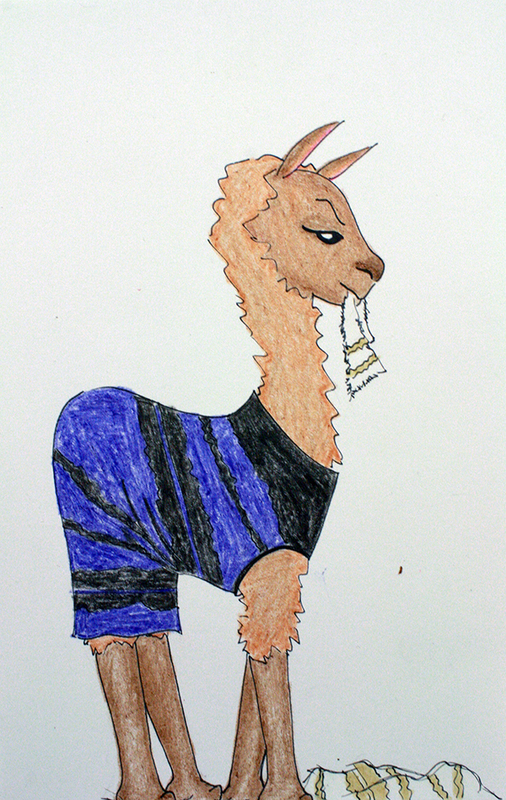 If you were on the internet today, here, I drew you a picture. 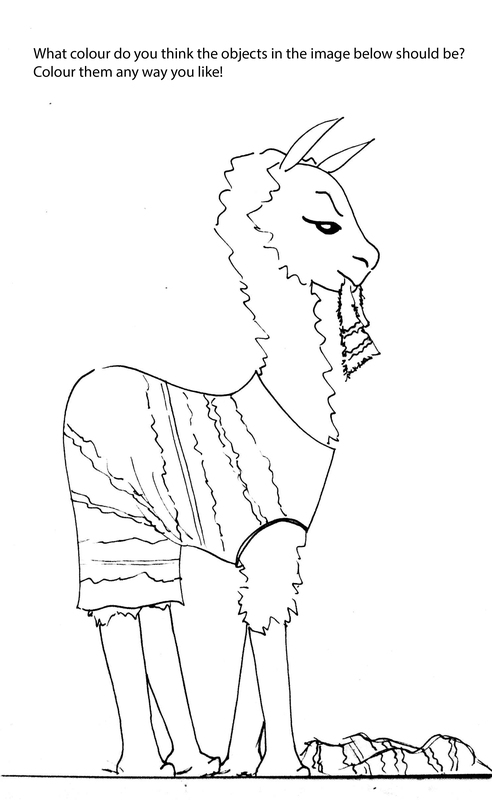 And I even made you your very own colouring sheet version. 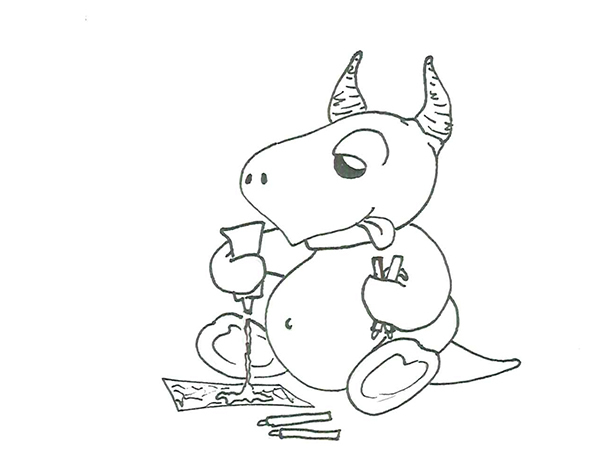 Because a bit of quiet time with crayons is probably something we all need today. Click on the link to download the PDF version. We don’t really suffer a lack of greenery out here on the west coast. The colour green (as well as the colour grey, numerous shades of it in fact, I’m sad to say) is generally to be found in great abundance out here. The trick is more to keep things from growing than anything else – those who follow me on Twitter may remember my recent photo-accompanied tale of mould invading our fan-less bathroom. But especially this year, a whole lot of people in other parts of the country are almost literally buried in snow, and green growing things probably feel a long way off. It seems like a good time of year to send a bit of surprise snail mail with something hopeful and distinctly UN-wintery – if the postman can get through the snowbanks to their mailbox, I suppose. My grandma, who lives in the snowy prairies, fills her basement with seedlings every spring, fostering them in the frost-free warmth of the indoors for a couple of months until it’s safe to transplant them into the garden. It makes the basement quite cheerful. I have a little terrarium on my windowsill that was gifted to me, and it makes me smile each time I look at it. 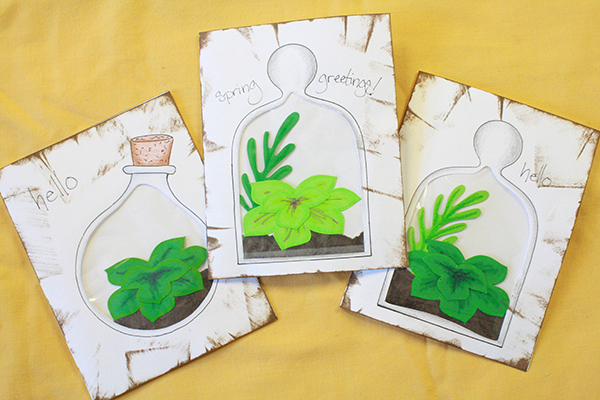 There’s something delightful about small, tenacious growing things (when they aren’t on your bathroom walls), so I thought it would be nice to put such things on a greeting card in this drawn out waiting-for-spring time. 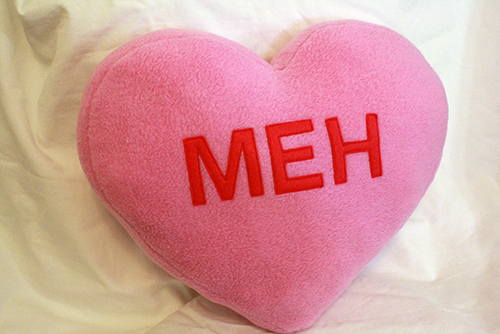 Excessive Valentine’s Day enthusiasm weirds me out. Me, I like a loving, caring relationship that is built on mutual adoration and respect, and a whole heaping lot of irreverent, sarcastic humour. Which may seem a little incongruous with the way I also love cuteness in most any form, but there’s something about the official tweeness of V-Day that stimulates my gag reflex. 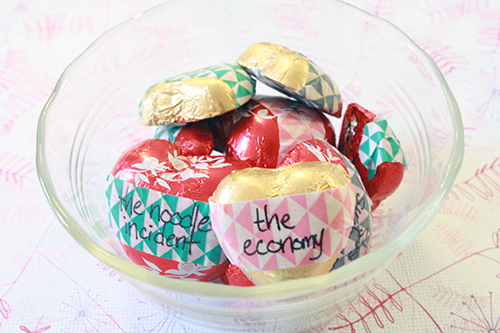 Candy conversation hearts are at the top of my V-Day “ick” list, with their saccharine sayings and sugared-chalk-paste flavour. 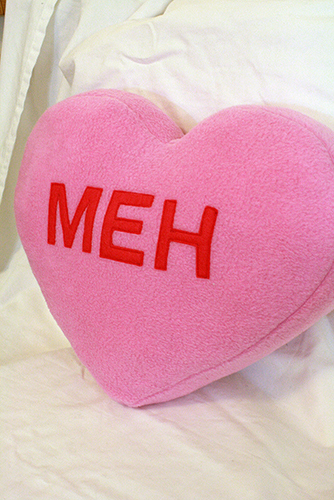 And so, for this Valentine’s Day, I’ve created a much more real kind of candy heart, in squishy huggable (or throwable) cushion form. Enjoy. 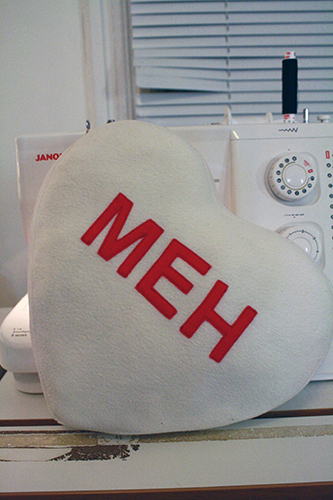 And if you want to make a heart cushion that’s serious, at least pick a better saying. Perhaps “As You Wish.” I’ll provide you a lettering template for that one too, just in case. 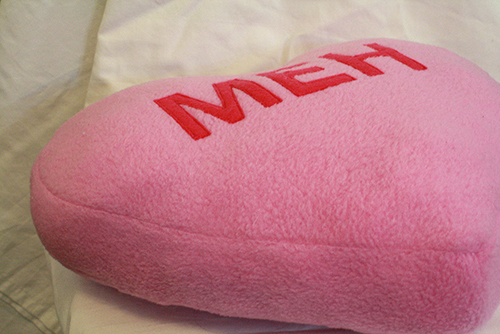 felt – fusia / dark pink if you want it to match the colour of the lettering stamped on irl candy hearts. 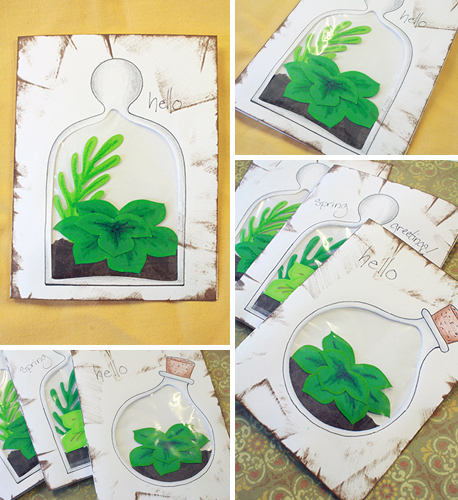 pressing cloth – a dish towel or scrap of cotton cloth will work just fine for this. You could even use a t-shirt. It’s just to keep your iron from melting your fleece. 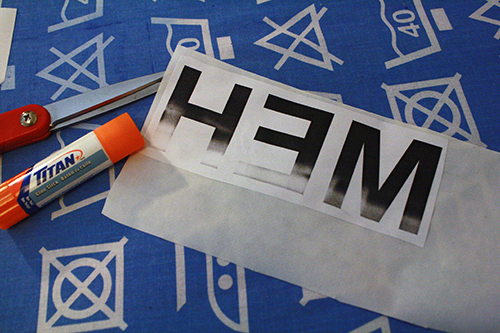 1) Print the lettering template and pillow pattern. Cut out the pillow pattern. 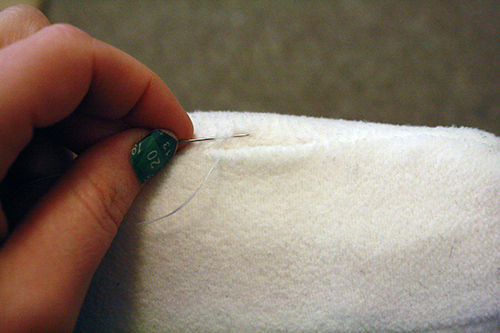 Fold your fleece in half, pin the pattern to the fleece with the straight edge of the pattern along the folded edge of the fleece. 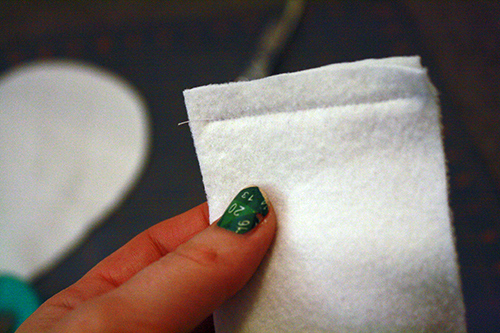 Then do this again with another section of fleece, so that you have two matching fleece hearts. 2) Cut two rectangles of fleece that are 19 inches long and 2 inches wide. 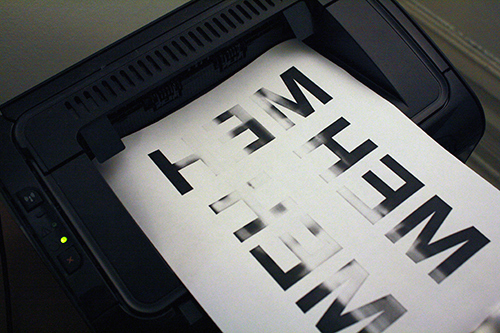 3) Take the printed sheet with the lettering on it (the letters will be backwards) and cut loosely around the letters, getting rid of the blank paper around the edges. 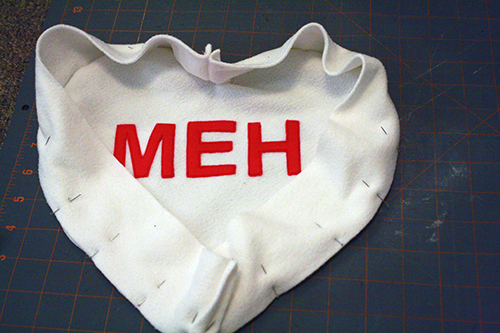 The “MEH” sheet has three instances of the word printed on it because why waste paper – save 2 of them for future pillows, or make 3 pillows at once if you wish. 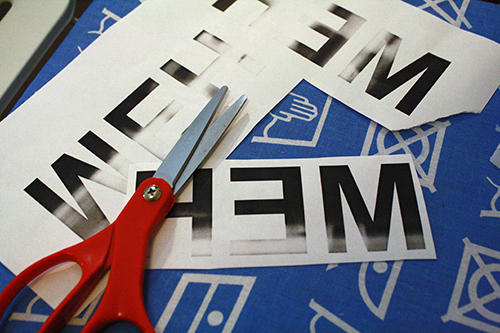 Apply glue to the back side of your “MEH” cutout, then glue it onto a piece of HeatNBond (glue it to the papery, not-shiny and plastic-y side of the HeatNBond). 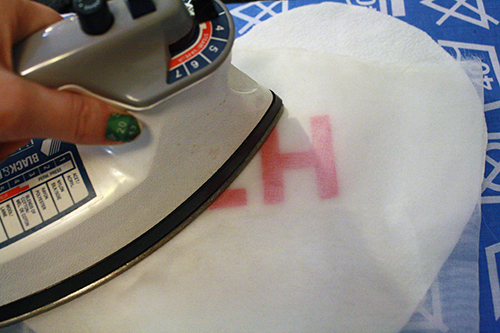 4) Turn your iron on to medium high heat, place your paper+HeatNBond on top of your felt piece, place another piece of blank, unprinted scrap paper on top of that* and then go over it all with the iron till the HeatNBond is fused to the felt (it should only take a few seconds). 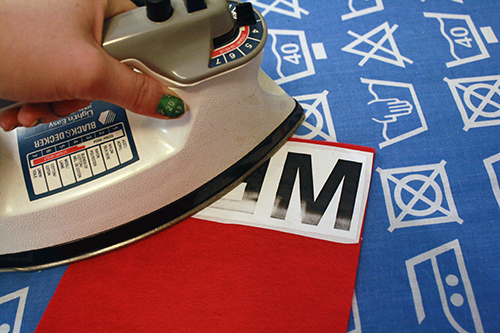 *This is important so that you don’t get printer ink on the bottom of your iron. I didn’t think to do it myself the first time through, as you can see in the photo below, but learn from my error! 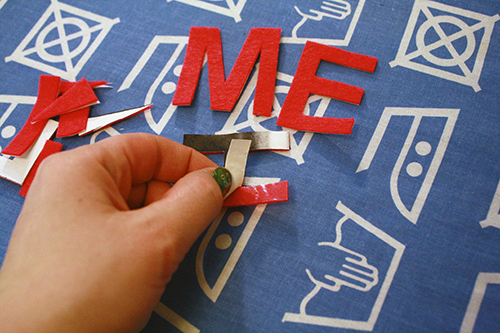 5) Cut out the letters, cutting through felt+HeatNBond+paper. 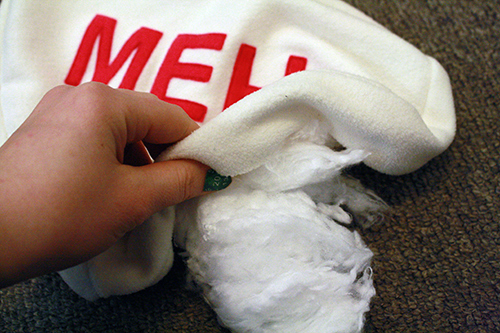 Then peel the paper and the papery portion of the HeatNBond away from the felt, so that you’re left with felt letters that have a plastic-y film on their back side. 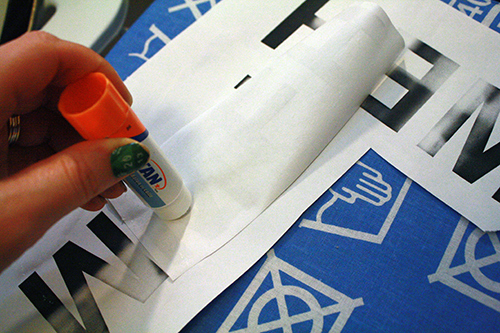 Basically, if you’re familiar with using HeatNBond for applique from some of my other tutorials or just your own experience, this new glue-printed-image-to-the-HeatNBond step is for efficiency. It allows you to skip the step of tracing the images onto the HeatNBond and makes the whole process faster, as well as tidier b/c you’re cutting the original lines of the image rather than traced (and therefor possibly less precise) ones. 6) Lay one of your fleece heart shapes out face up and lay the letters out on top of it, placing them exactly where you want them to end up. Make sure they’re not too close to the edge, and are approximately centered top-to-bottom. Place your pressing cloth on top of all this, then iron over the lettering, pressing down firmly, and probably letting the iron sit for 10-30 seconds to get the felt to fuse to the fleece. The pressing cloth is important because the iron needs to be on high heat to fuse the layers, but high heat in direct contact with fleece can melt and warp it a bit, so the pressing cloth prevents that. 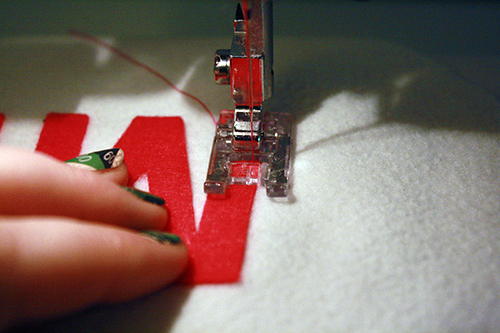 7) Thread your sewing machine to match the colour of the felt letters, and using a small straight stitch, sew around the edges of the lettering, just a wee bit in from the edge. 8) Pin your two fleece rectangles together at both ends, with right sides facing together, and sew those ends together, straight across. 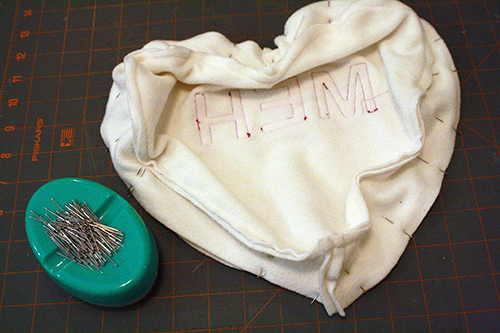 9) Pin one edge of this loop of sewn-together rectangles to the edges of your lettered heart shape, so that the right sides of the fleece of the loop and the heart face together. 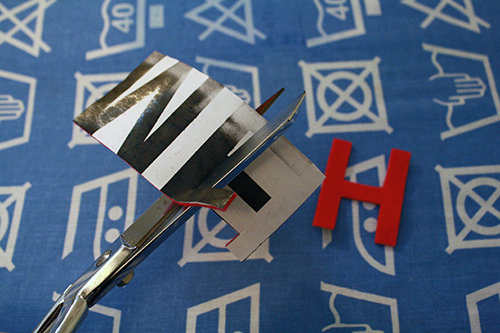 Match up the seams of the rectangle loop with the bottom point of the heart, and the top indent of the heart. 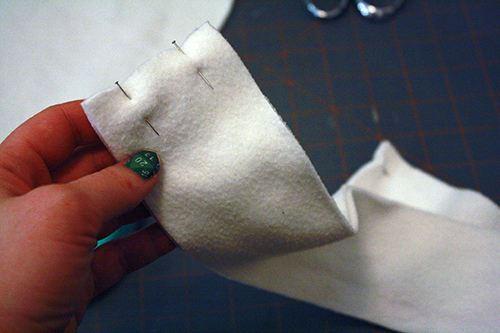 Sew all the way around this, removing pins as you go. 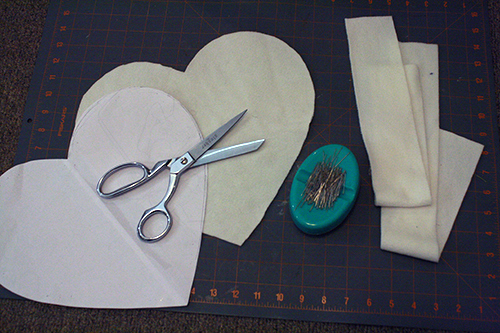 10) Now pin the other, un-lettered heart piece to the unsewn side of the rectangle piece. 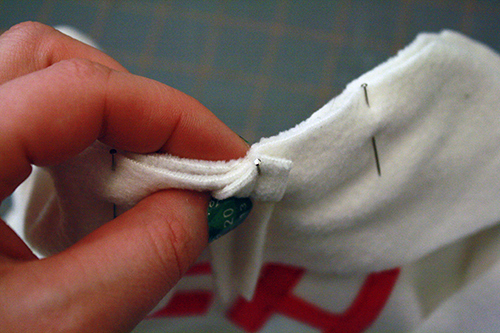 This time though, along one side of the heart, leave a section about 3-4 inches long unpinned, and put double pins on either side of it to remind you not to sew this section closed. Sew around this, leaving that one section open. 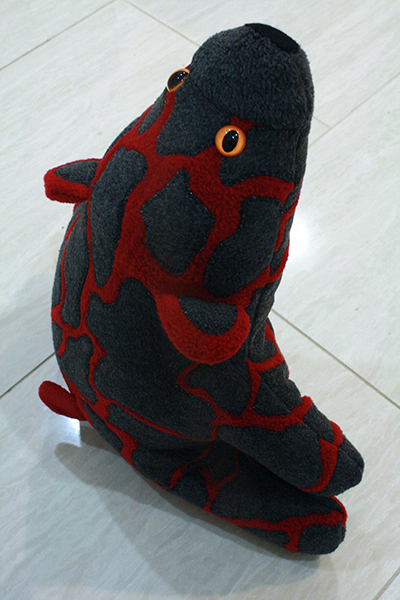 11) Use the unsewn area to turn the whole thing right side out, then stuff the whole shape with polyfil. 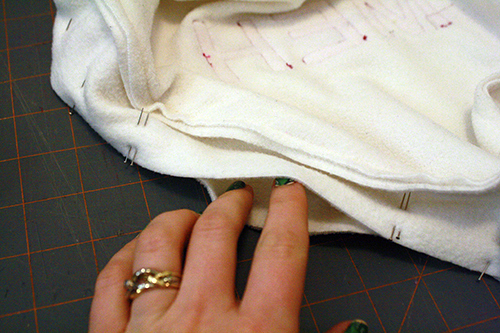 12) Pin the gap closed, tucking the raw edges inside, and use a needle and thread to stitch it shut. 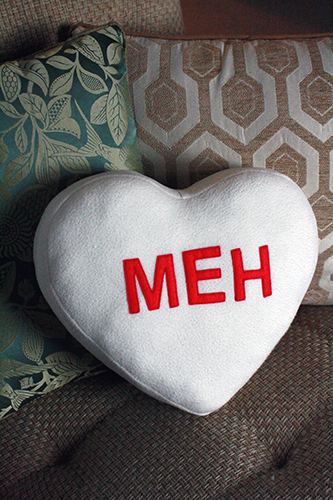 13) Place on your couch (or your significant other’s couch) to let everyone know just how you feel about this whole emotion-soaked Hallmark holiday. Then grab a glass of wine and turn on Diablo and go skewer zombies to relieve your feelings.